You may be surprised to know that one of the most popular vehicles in America isn’t a cushy sedan or spacious SUV — it’s Ford’s half-ton pickup, the F-150. Take a close look at this truck’s features and capabilities and you’ll see why so many Americans pick it. Put simply, it’s one of the most well-rounded, capable, and durable vehicles on the road today. What’s New for the F-150? Ford’s half-ton truck won’t see major changes going into the new model year since it’s in the middle of a generation cycle. Rather, some trim level updates are coming. Specifically, the F-150 limited now comes with the 450-horsepower 3.5-liter EcoBoost engine — the same powerplant used in the F-150 Raptor. Plus, new luxury amenities like massaging front seats, ash swirl wood trim pieces, and 4G LTE Wi-Fi connectivity make the F-150 a truck to pine after. A good truck must do much more than simply looking the part — it needs the capability to back it up. The Ford F-150 does just that. Choose the Ford F-150 and you’ll get to pick from six unique engine options. The standard unit is a 3.3-liter Ti-VCT V6 with 290 horsepower. An available 2.7-liter EcoBoost V6 brings numbers up to 325 horsepower and 400 pound-feet of torque. Its big brother, the 3.5-liter EcoBoost V6, takes power up to 375 horsepower and 470 pound-feet of torque. An upgraded version of this engine available in the Raptor and Limited trims bumps power to 450 horsepower. The popular 5.0-liter V8 offers a commanding 395 horsepower and 400 pound-feet of torque. 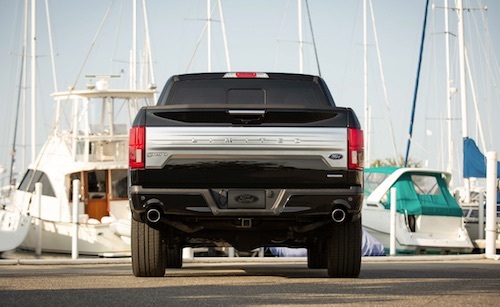 Newly available is a 3.0-liter Power Stroke Turbo Diesel engine with 440 pound-feet of torque. All F-150 trucks carry the same spirit of utility and durability, but not all have the same standard features. Take a look at the trim levels below to get a sense for which could be the best for you. A few nifty features in the F-150 stand out for their sheer convenience. From towing assistance to easy cargo storage, the F-150 is equipped for impressive utility. 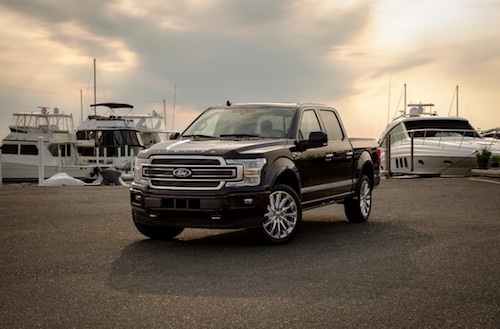 Smart Towing: Whether you’re lining up your hitch, backing up a trailer, or keeping an eye on your load on the road, the F-150 has a range of smart features aimed at simplifying towing. Pickup Box Features: Available features like stowable loading ramps, LED box lights, remote tailgate release, and more make packing payload a breeze. Flat-Load Floor: You don’t have to relegate cargo just to the pickup box. Fold the rear seats up in your SuperCrew F-150 and you’ll have space for all kinds of gear with a flat loading area. Up first is the F-150 XL. This model comes standard with a 290-horsepower 3.3-liter Ti-VCT six-cylinder engine paired with a six-speed automatic transmission. Four-wheel drive is also available for tackling off-road situations with ease. Standard features in the F-150 XL include durable cloth seating, vinyl flooring, an Easy Fuel capless fuel filler, an SOS Post-Crash Alert System, and a rearview camera with Dynamic Hitch Assist. Available options include a SYNC infotainment system, a Kicker Subwoofer, satellite radio, Ford’s MyKey system, and remote keyless entry. For more information and to get behind the wheel of your own new 2018 Ford F-150, get over to Stillwell Ford Lincoln. Our staff realizes your time is valuable and will work to pair you with your new F-150 today. While you’re here, be sure to speak with our finance experts as well. We have a finance department on-site to help you get approved while staying within your monthly budget. Whether you’re considering buying or leasing, let us find you the best Ford leasing offers available. Contact us or stop by for more information, and see why so many customers have made us their local Ford destination.